Persecution of Christians is on the increase throughout the world today. Nevertheless, even in those countries in which some of the most severe persecution is taking place, a slow growth in numbers of Christians is actually being recorded. Statistical analysis of available data from the Open Doors World Watch List (WWL) and the World Christian Database (WCD) has revealed some interesting results. Where one might have expected a negative influence of persecution on church growth, we found no statistically significant relationship between any change in the level of overall persecution and church growth. 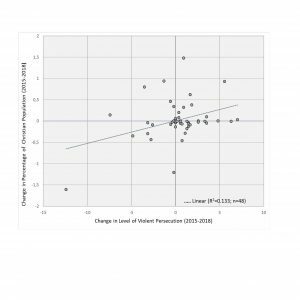 Even more striking, what we did find was a significant correlation between increasing levels of violent persecution and positive church growth over the recent three-year period (2015-2018). What happens in these countries? In our analysis we see that 39 countries (81%) experience increase over 3 years in general Total Persecution. The increase of Violent Persecution is in 28 countries (58%). To get more insight about the countries in our analysis, we look at the Figure 1. We see right in this figure the countries who have an increase in violent persecution over the 3 years period (28 countries). Left we see the countries with a decrease in violent persecution. In the top we see the countries with an increase in church growth. Below we see the countries with decrease in church growth. We can split all our countries in four quadrants. For example: in the right – top we have 10 (21%) countries with more violence but still with a growing church: the surviving church. The right – low are the 18 (38%) countries with more violence and decrease in numbers of Christians. So we can make a list or overview of all the present 48 countries with most violent persecution distributed over the four corners of Figure.